• Blue 12" x 15" 0.080 aluminum sign plate. Choose your sign wording above. • Solar Powered flashing blue light. Shock-proof and NEMA-4X rain and dust proof. 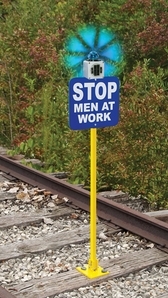 • Gravity switch activates light when sign holder is at 45 degree angle or greater. Brilliant 6-LED light visible for over a mile. • Cut spikes to attach to timber or resin ties.